Sawadee ka! I have always fancied Thai Food. It’s exotic, fresh, sometimes spicy, but always mouth-wateringly delicious. As we wandered the streets of Bangkok in our recent trip to Thailand, I re-discovered that the secret ingredient of Thai food is ‘balance’. In every colorful dish, there seems to be a perfect harmony between sweet, sour, hot, and salty. Pungent fresh herbs, to all sorts of spices, offset by salty sauces, and finished off with a squeeze of lemon or lime. And yesterday, I might have just discovered a secret heaven of this amazing cuisine. 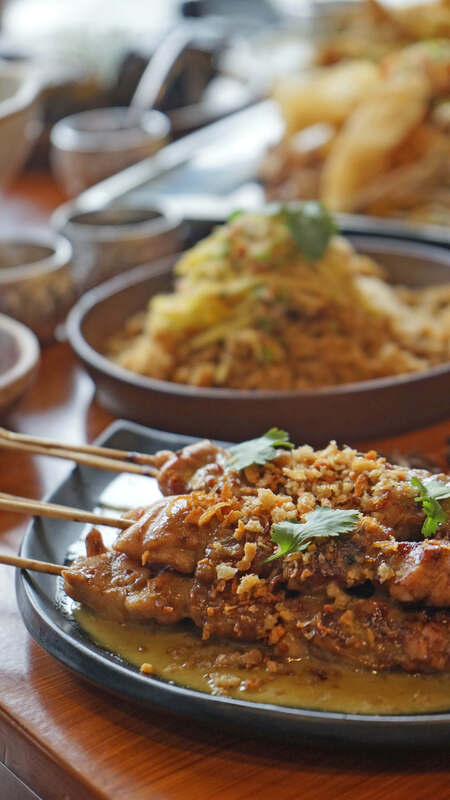 Located in Teachers’ Village, Quezon City, Muang Thai Restaurant may be the only Thai restaurant you need in your life right now! 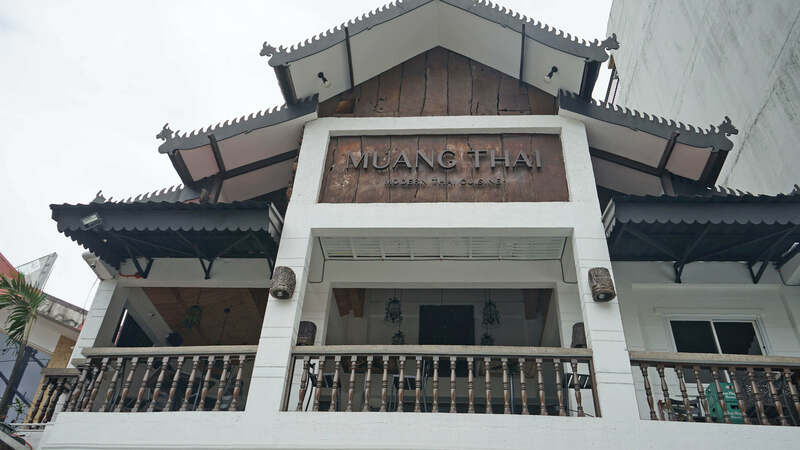 Originally located in Banawe Street, Muang Thai Restaurant has since moved to their new home. Muang Thai is now at the bustling East Avenue area, along Malakas St., Quezon City. 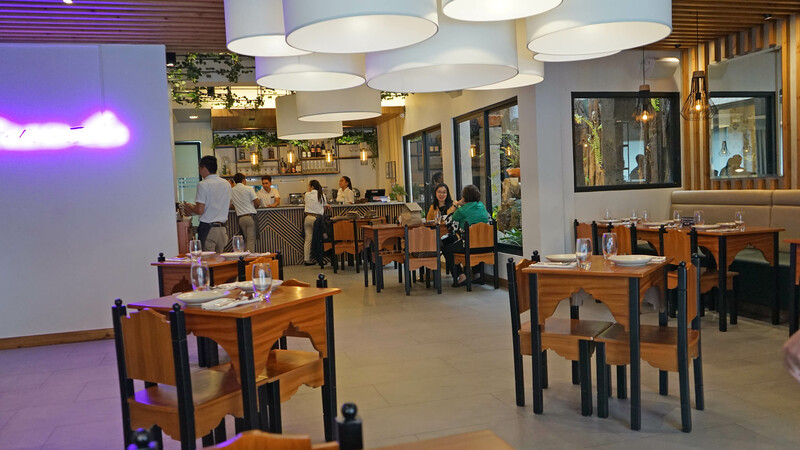 Once you step inside, you’ll surely take delight in its lush zen interiors – light colored walls, wooden tables and chairs, accented with literal pocket gardens around the whole restaurant. I also loved the mix of decorative lights and the natural light from all sides of the place. I must say, 5 stars for the interiors and zen-like ambiance! They say first impressions matter. 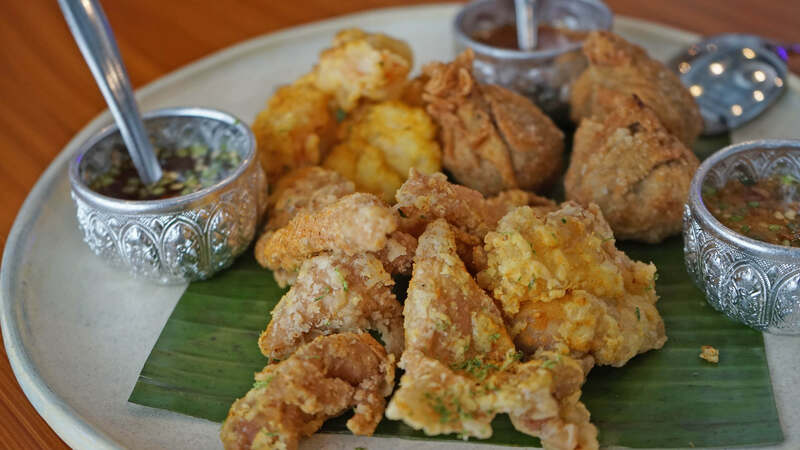 Good thing Muang Thai Restaurant Quezon City has something wonderfully delicious up their sleeves: the Fried Appetizer Sampler. It’s made with Golden Pouches (like wonton wraps), Fried Shrimp, and Thai Chicken Skin (ala chicharon). Loved how everything was crisp to a golden brown while the slight saltiness definitely whet my appetite! I normally don’t eat catfish but I’m willing to make an exception for this one. 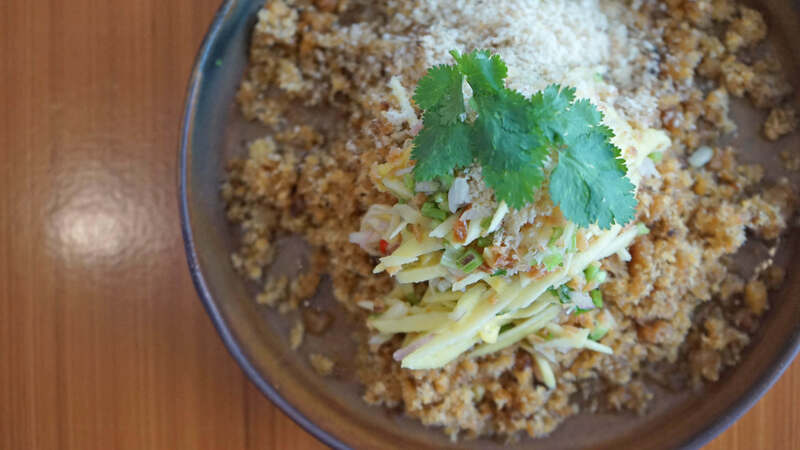 Muang Thai’s Yum Pla Dook Fu is a fried catfish dish with green mango salad. I loved the floss-like texture of the meat combined with the tangy flavor of the green mangoes. It was savory yet light enough to make everyone crave for more! 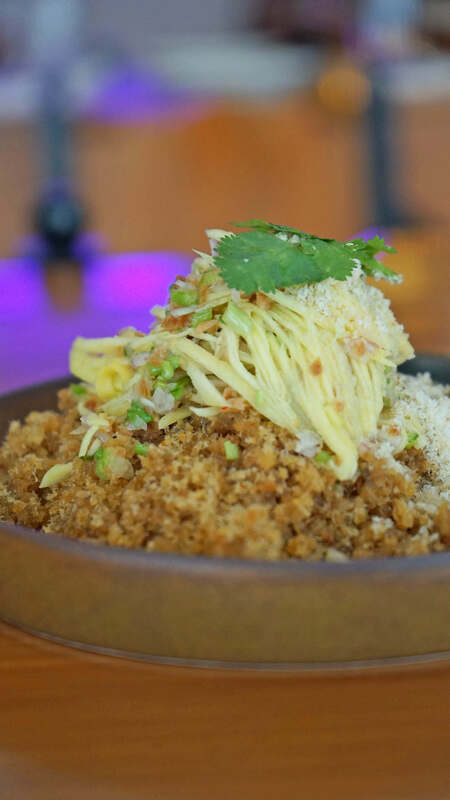 Muang Thai Salad (Php 210.00) – HTD Favorite! I love pomelos and I love shrimps. And putting them together in one dish means an explosion of fresh, island flavors! 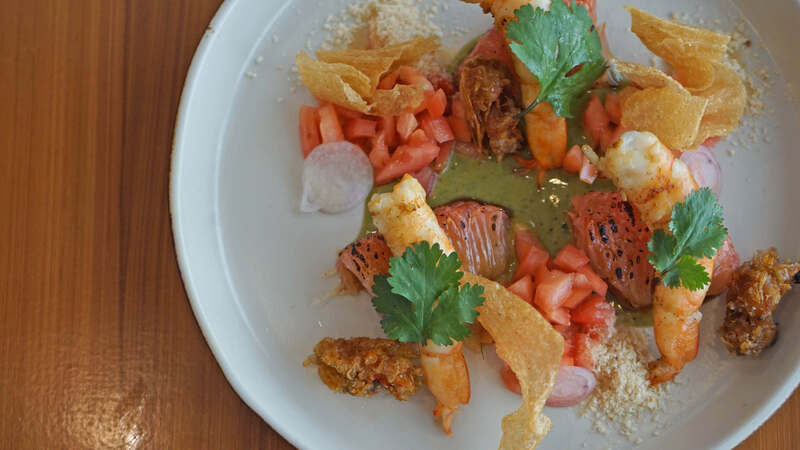 Pomelo macerated in panocha coconut syrup with char-grilled shrimp, roasted nuts, and fried shrimp heads. I just loved how the smoked flavor of the shrimps blended well with the citrusy zest of the pomelo slices. Tom yum soup of charred shrimps, clams, squid, and fish fillet. I love my soup creamy and thick. So admittedly tom yum is not my cup of tea. 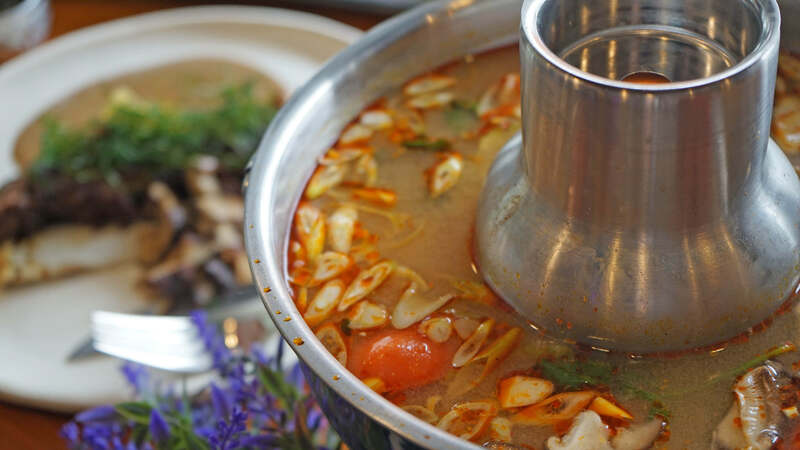 Muang Thai Restaurant’s Tom Yum version was just okay. Not too spicy and not so sour but lacked the flavor and thickness of others I’ve tasted before. Khao Kluk Kapi (Php 360.00) – HTD Favorite! 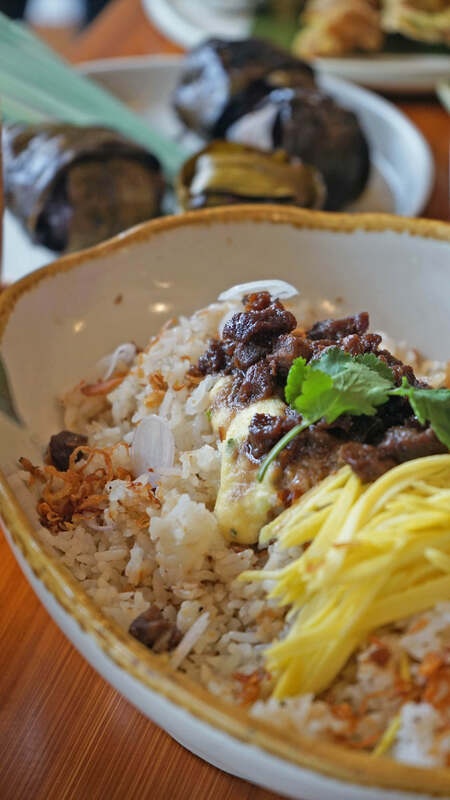 Their version of Bagoong Rice, Muang Thai Restaurant’s Khao Klu Kapi was a hit amongst everyone in the group! Shrimp paste fried rice topped with egg sauce, fresh mango slices, raw shallots, and cured pork bits. Everything balanced each other well – just like how authentic Thai food should be. 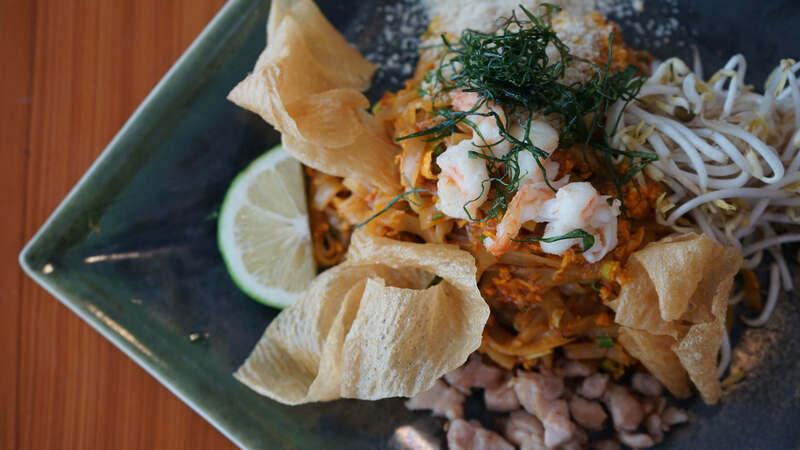 Of course, no Thai foodtrip will be complete without the signature Pad Thai. Wok-fried rice noodles cooked in tamarind sauce with seared shrimps and chicken topped with fried tofu curds. I appreciate the flavor behind Muang Thai’s version – well-seasoned, freshly made, with an excellent medley of textures. But I personally feel the added spice might catch other people off guard. Craving for satay? 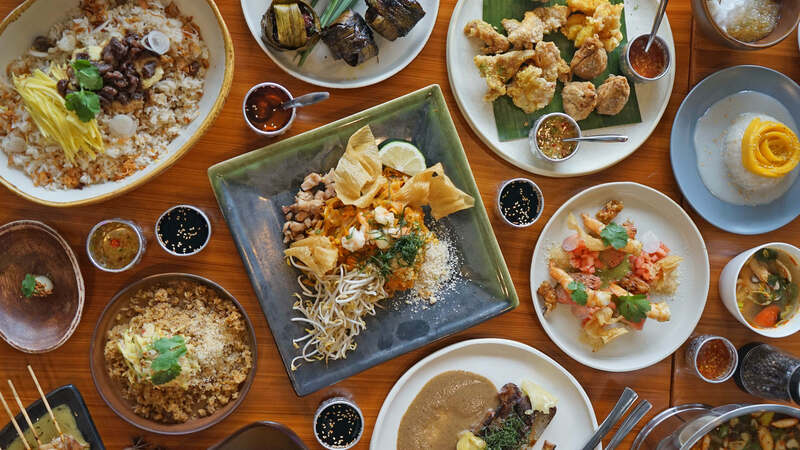 Take on Muang Thai Restaurant’s Satay Sampler Platter. A sample platter of Satay Goong, Satay Muu, and Satay Gai served with peanut sauce and Thai vinegar. I enjoyed the well-marinated meat, the generosity of the thick sauce, and the tenderness of each bite. Gai Hor Bai Toey (Php 310.00) – HTD Favorite! 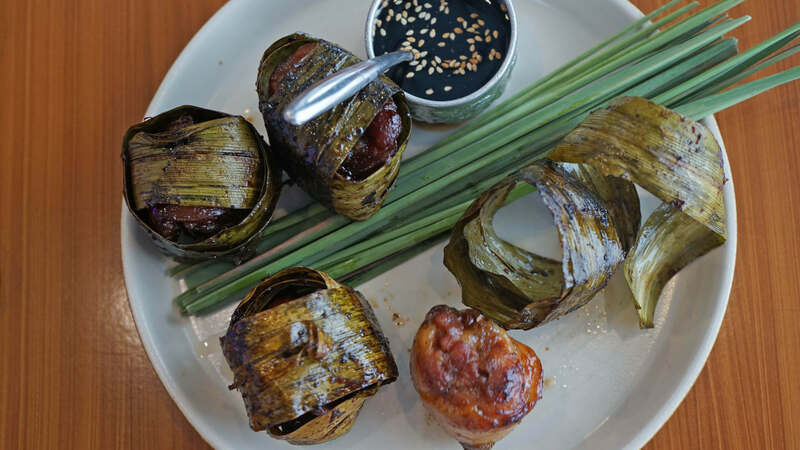 Thai pandan wrapped chicken served with homemade soy sesame sauce. Unlike other versions of Chicken Pandan I’ve had before, Muang Thai’s Gai Hor Bai Toey is real value for money. They were very flavorful, were super tender, and were big (maybe 2.5-3 inches all around). Sulit! Grilled beef short ribs with sauteed mushrooms, roasted pineapple, and ground toasted rice. Choice of: Cilantro Pistou or Massaman Curry. Ah, this one was too pretty to eat! But one bite and it was enough to send me to food heaven. 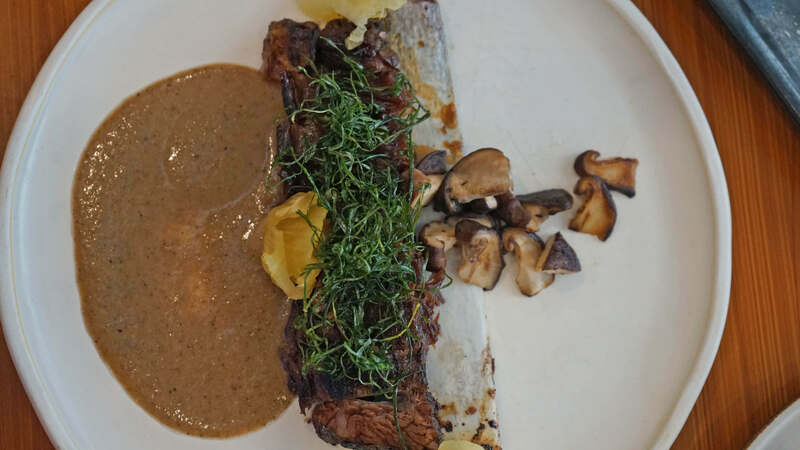 A sort of Thai version of a western steak, excellent effort! Mu Krob (Php 360.00) – HTD Favorite! Curry-curry or kare-kare? Have both with Muang Thai’s Mu Krob. 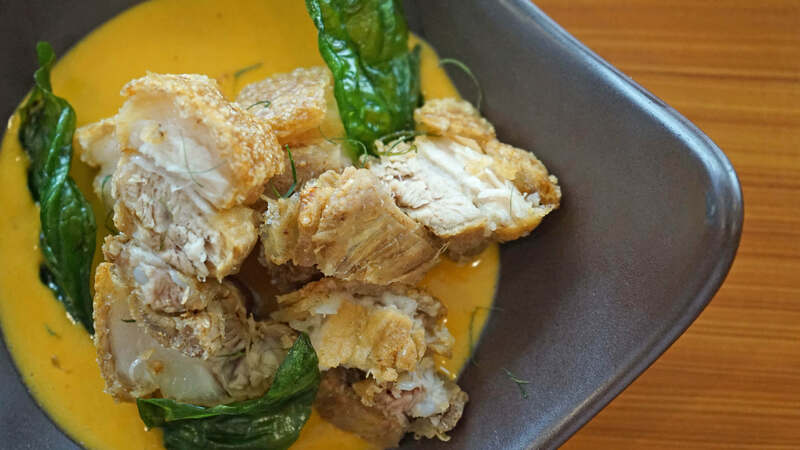 Crispy pork belly with a choice of green, red, or panang curry sauce. We had the panang curry at Muang Thai Restaurant and it was sooooooo good! 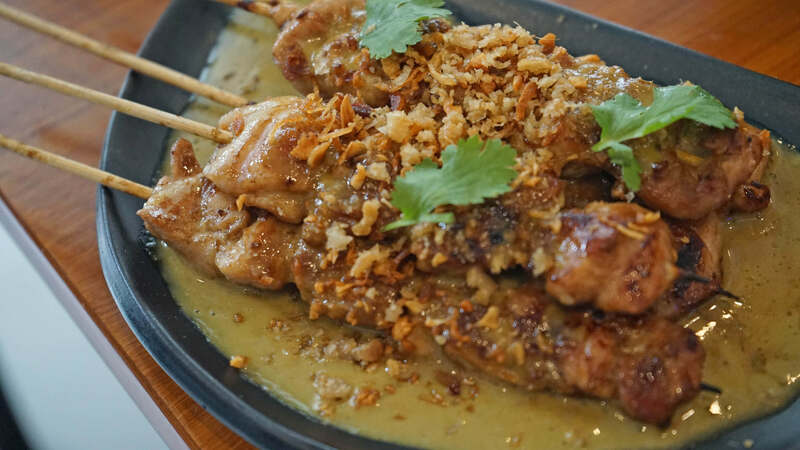 Extra crispy pork belly chunks drenched in extra thick peanut curry sauce! Just thinking about it, I need more rice! 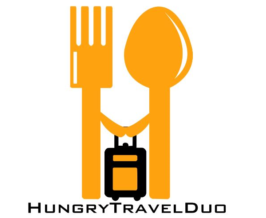 Mango Sticky Rice (Php 110.00) – HTD Favorite! Still have room for dessert? 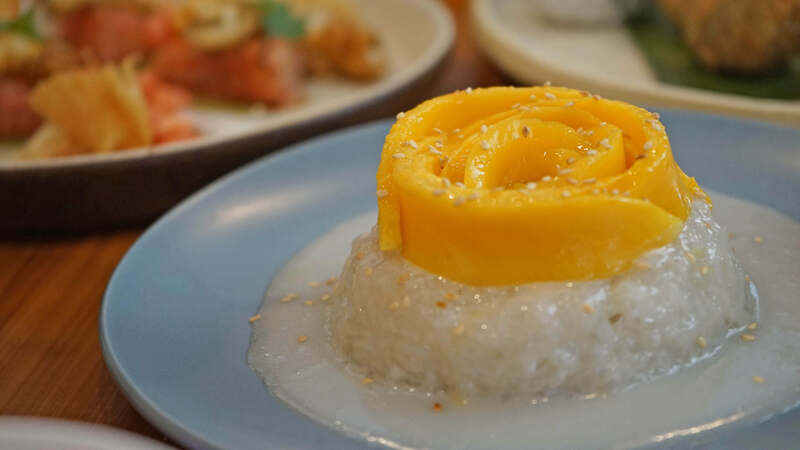 The Mango Sticky Rice from Muang Thai Restaurant is not to be missed! Glutinous rice with coconut sauce and riped mango. Loved how the coconut sauces really permeated into the grains of the rice, making it thick and tasty. Coconut custard with young coconut puree and tapioca. Sadly, I was so full so I didn’t get the chance to sample this one. But I heard it’s also a delightful sweet-ender to a lovely, savory meal! 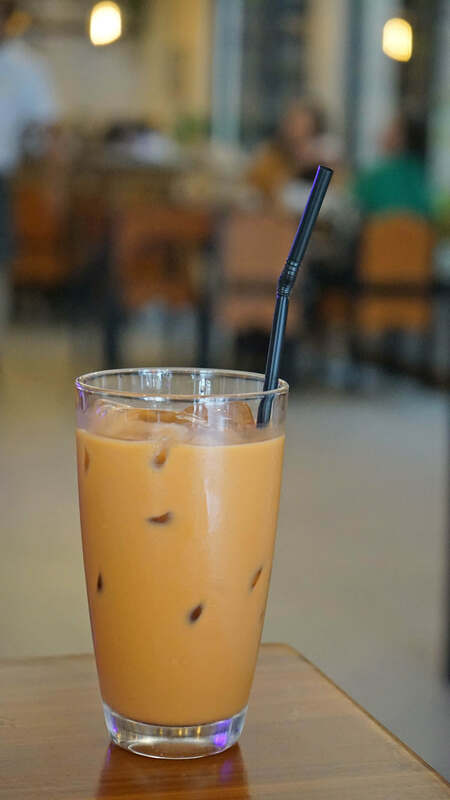 Don’t forget the Thai Milk Tea! Overall, I’d totally recommend dining at Muang Thai Restaurant Quezon City. Everything in the menu was well-thought of, delicious, and real value for money. Kapunka, Muang Thai!